The ceramic plate diffusers are one of the most robust engineered products from AirOxi Tube which are extremely efficient. The ceramic plates have been designed in such a way that it is quite strong and highly durable. The thickness of these ceramic diffuser plates has been increased a bit as compared to the traditional plates. The dimensions of the ceramic plate diffuser are 310*115 mm with the inlet size being 5 mm or above. The size of the pores is extremely small so that it is able to produce nano bubbles or it can be said that it simply produces a cloud of bubbles in the water. 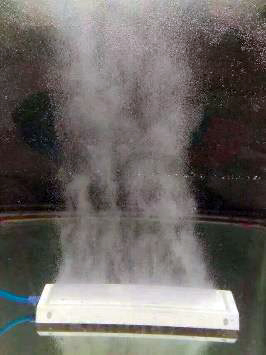 According to the oxygen and water content, the diffused gas may quite easily pass into the solution directly without any kinds of visible signs of bubbles. These nano bubble ceramic plate diffusers are extremely efficient in nature which is capable of providing about 25 to 30 percent air transfer. This air transfer actually depends on the depth at which they are installed. The flow is quite optimal and the working gas pressure should be as such that it does not cause any damage to the diffuser. The product is just ideal for the purpose of an extremely efficient and effective aeration in the pond for the production of fishes. Thus, it can be rightly said that these ceramic plate diffusers are simply unmatched to any others which is the reason as to why they are highly preferred. The ceramic plate diffusers come with a number of advantages which are as listed below. First and foremost, these diffusers are extremely efficient in nature. Sufficient supply of oxygen in done by the diffusers. The bubbles produced are extremely fine which are not even visible but appear as a cloud since the gas actually goes directly into the solution. The product sinks by itself that is self – sinking in nature. This makes the process of installation very easy and it just needs to be dropped at the appropriate place. The product can be used with oxygen or ozone cylinder. The ceramic plate diffusers can be readily used in the Recirculation aquaculture systems and also in the hatcheries. The product can also be ideally used at places where very fine bubble size are required along with a very high oxygen transfer efficiency. visit: www.airoxitube.com for more information.